“The truth hurts” is one of my least favorite cliches. In the long run, the truth almost always helps. 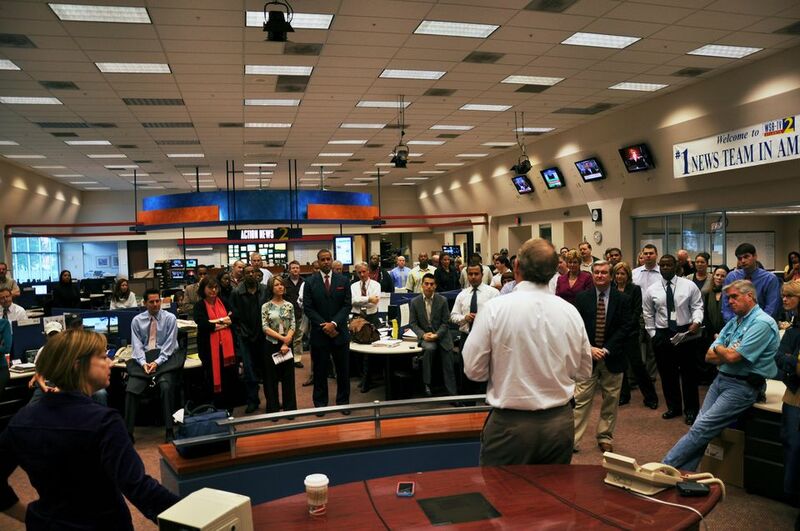 The pursuit of the truth, coupled with the pursuit of interesting stories (and an audience for them), drives news folks. In a perfect world, those goals would always mesh perfectly all the time. Today, I’m here to praise a DeKalb County Public Information Officer for resisting the temptation to try to shape the truth. Last week, I produced a story highlighting a practice of police officers in urban areas across America. I’ve seen police officers use on-board dash-mounted laptop computers for most of my career. The computers provide vital communications without tying up police radio frequencies. It’s fair to say that patrol officers in busy urban areas use them almost constantly. The zeitgeist tells us that texting-and-driving is the latest deadly killer stalking the innocent. Oprah has apparently denounced it. A bill in the Georgia General Assembly would outlaw it. 11 Alive News has an online page devoted to its elimination. If you’re like me, you casually check out other motorists to try to catch them in the act, and frequently succeed. But police officers are the original distracted drivers. They don’t just watch traffic. They watch the community. They use two-way radios. They use on-board computers. They drive with more distractions than even TV photographers. Earlier this month, I interviewed DeKalb police chief William O’Brien about a couple of issues related to police driving. 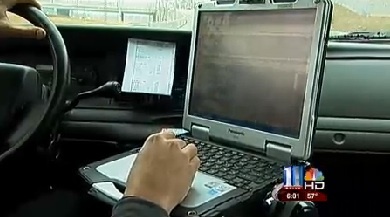 They included the on-board computer in patrol cars. O’Brien was refreshingly candid. He called them a “necessary evil.” He said police depend on them, and that by extension, so does the public which demands effective police services. He admitted that distracted patrol officers using them have occasionally collided with other vehicles. He neither sugarcoated, nor did he spin. Three days later, DeKalb PD allowed us to videotape a patrol officer on the road. Though the police department’s public affairs office knew why we’d requested the ride-along, it apparently made no effort to try to shape the footage by warning the officer to avoid using his on-board computer. The officer, Kabe Jenkins, appeared to be a sharp, conscientious rookie cop. If my wife or daughter calls 911, he’s the kind of guy I’d want showing up in my driveway. Jenkins borrowed a Sergeant’s patrol car — which lacked a backseat cage, allowing photog Richard Crabbe to more easily maneuver his camera. Crabbe rode with Jenkins, and I followed in a WXIA vehicle. Crabbe’s ride probably lasted less than twenty minutes. Almost immediately, a call came for Jenkins to help control traffic around a gas leak in Avondale Estates. Jenkins began using the onboard computer to get clarification. Mostly, he used the computer while slowing or stopping at traffic lights. But he wasn’t shy about using it on the move. As Lt. Scott Kreher, president of Atlanta’s IBPO pointed out, the onboard computers are mounted just below the windshield. He opined this is far different from a teenage girl texting “CU soon” on her cellphone while behind the wheel. Nonetheless, the video was eye-opening. The raw footage showed Jenkins driving almost constantly with one hand on the keyboard, using the computer much of the time. Initially, it alarmed some DeKalb police officers, as reflected by some comments in the DeKalb Officers Speak blog. They were apparently miffed that Public Affairs didn’t try to shape this story better. Some cops in the Central Precinct apparently thought I’d hoodwinked the department into allowing the ride-along by telling Public Affairs my story was about something else. But public affairs officers Mekka Parish and Jason Gagnon both watched my interview with Chief O’Brien. They knew we’d talked about the distracting qualities of onboard computers. 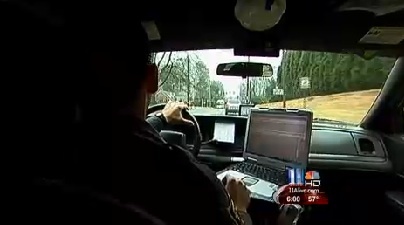 Prior to the ride-along, Parish could have told Jenkins: “They’re reporting on distracted driving. Minimize your use of the onboard computer.” Instead, I heard her tell Jenkins: “Do what you’d normally do.” It was a refreshing act of transparency that was consistent with O’Brien’s candor, and Parish deserves praise for it. Because in the long run, the truth doesn’t hurt. This entry was posted in WXIA on March 1, 2010 by live apt fire. The Center Precinct command staff (Major Hidgon, Captain Lillard and demoted Assistant Chief Dedrick) are not the sharpest knives in the drawer. Have you ever seen Higdon at a community meeting? It’s entertainment for sure. For the record, I think the command staff at Center Precinct do an outstanding job. Outstanding…and it brings home something I’ve said all along. I fully agree that doing anything besides driving, be it texting, talking, typing, or eating a cheeseburger, can, in some circumstances, is not the best idea. However, most of us have learned to multi task, and we keep the majority of our brain focused on the driving, so we go down the road, munching and chatting, switching radio stations, combing our hair, and scolding the kids in the back seat, with no problem at all. No problem, right up until something unexpected happens. That’s when it becomes a problem. The extra hundred feet we’d have had to stop when the guy pulled out of the driveway had we been looking instead of talking could have prevented the wreck. However, it goes down as his fault because he’s the one who started the action, so we stand there waiting on the tow truck, fuming because he pulled out. We never think that, maybe, just maybe, had we been looking where we were going, AND FOCUSING ON OUR DRIVING, we might have had time to stop. Pilots have dealt with this for years. They fly along for hours in an automatic aircraft that needs nothing from them. Right up until the rudder system jams, or another aircraft encroaches on them. That’s when the pilot earns his money. Today’s cars require much less input from drivers, so we tend to roll on “autopilot” right up until the unexpected hit. Put most drivers in a 63 Chevy pickup with no air, no power steering, and a stick, and you’d cut the number of “asleep while driving” crashes way, way down. But, that’s not going to happen, so the best answer is to learn what this package showed us. As they mentioned, mounting the unit at eye level makes a huge difference, as does the size of the screen, it simlply takes less of his attention away from the road. All in all, a great piece that raises a significant question. Will they have to wire the cars so the keyboard won’t function when the car is in drive, or will they be exempt? If so, why should they be?